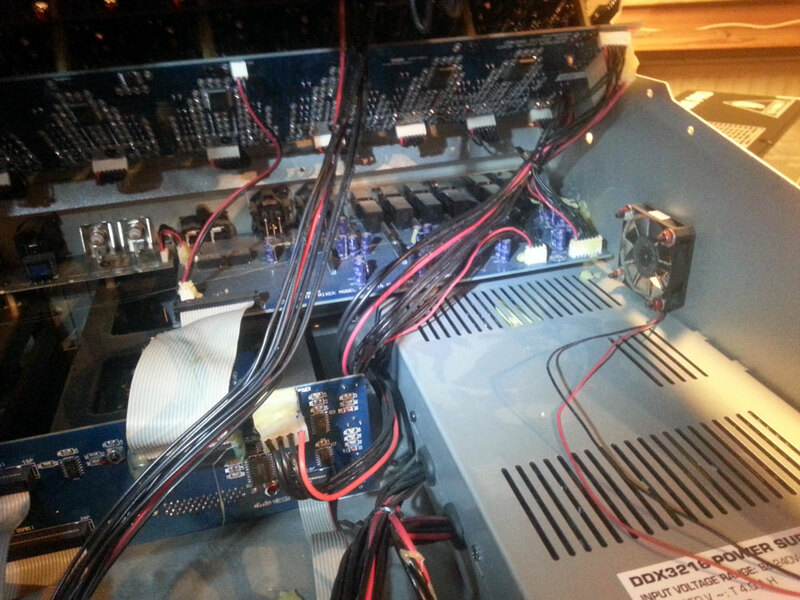 Replacing the capacitors in the power supply of the DDX3216. First of all, a whole lot of upper part screws need to be removed, except four of them. 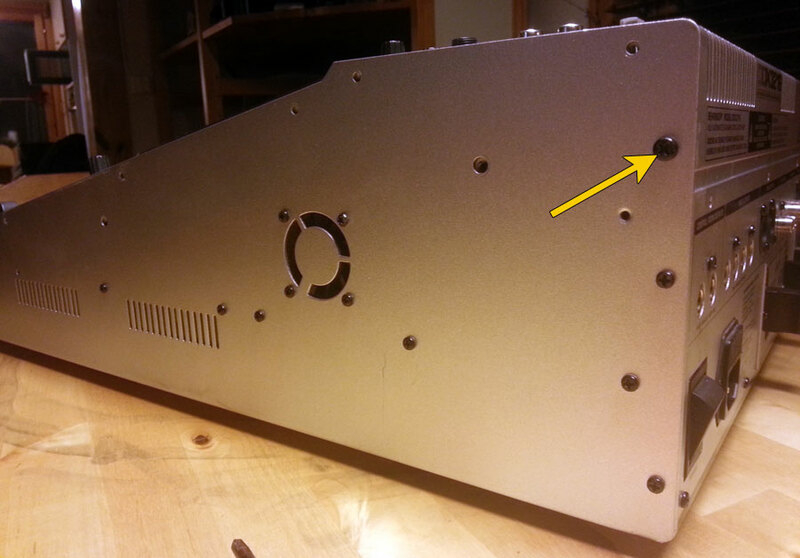 The arrow in the picture points to a screw which should be slacked just a little, on both sides. These act as a hinge when all the other screws are removed. I found out later that under the hinge screws there are two very long screws which only act as a support for the mix panel. Once the cables are removed and you're ready to remove the hinge screws for final separation of the top and the bottom parts, the weight of the upper mix plate rests on them. Those would be the holes in the picture at seven o'clock from the hinge screws. 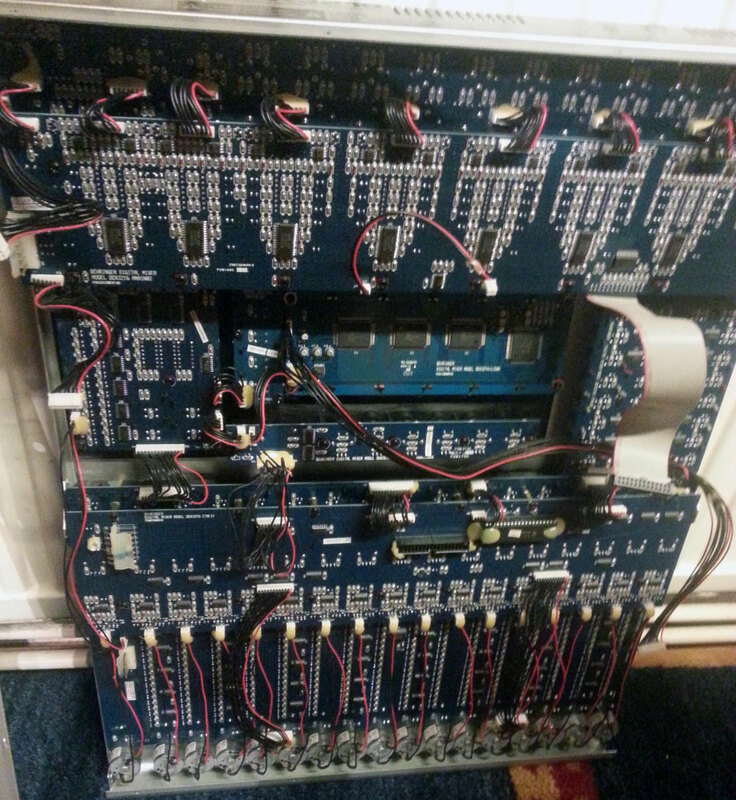 No foul, I managed to hold the mix panel in place while removing the hinge screws. You might want to leave them in place. There are A LOT of screws. Four of them are hidden under the nose of the mixer, and you also have to remove the ones on the back (as you can see from the picture). 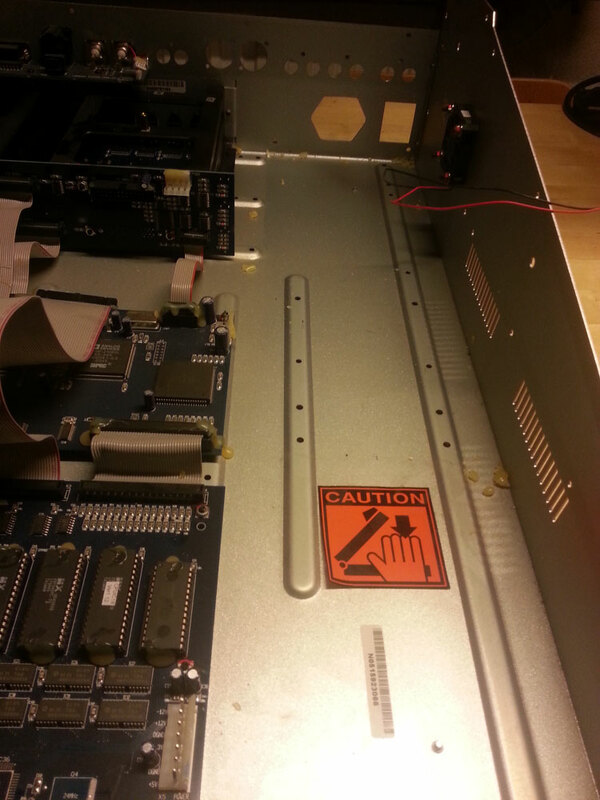 Basically, remove all the screws which are located above the waistline of the mixer, on the outer layer. Once all but the hinge screws and the load-bearing ones are removed, we can lift the upper plate from the front and peek inside the mixer. Be really, really careful and watch all the cables while you lift the mixer top, since most of the cables are quite short. Start removing the power connectors - the once which are glued, are removable. The other ends usually are not. Hot glue (a.k.a. hot-melt adhesive) gets fragile with age and is easily removed using pliers, flat screw driver and some patience. Mark the cables as you go, or use a felt tip pen to draw a line into both parts of the connector, so you have a reference once they all have to go back. Most of the connectors are polarized. 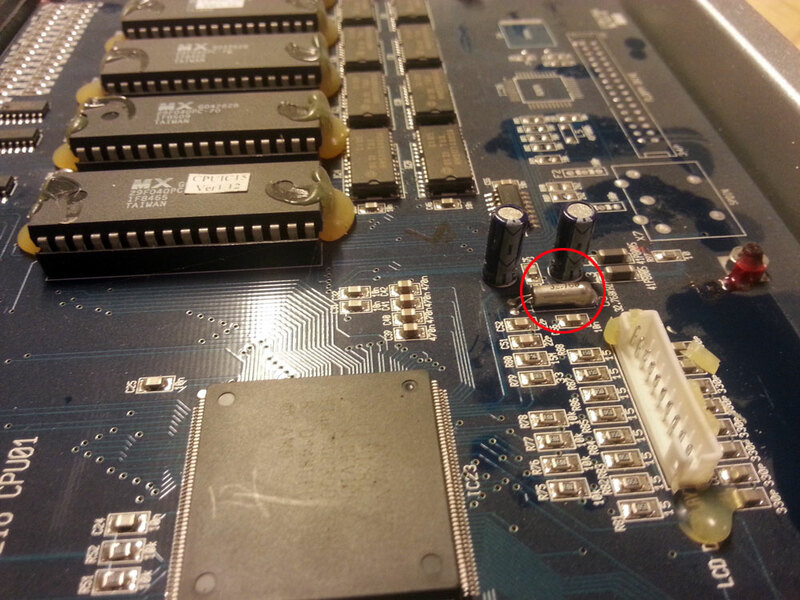 If you manage to pull a connector shroud out with the connector, do not despair - the PCBs have connector outlines drawn onto them, and you can usually push the shroud right back on to pins on PCB. 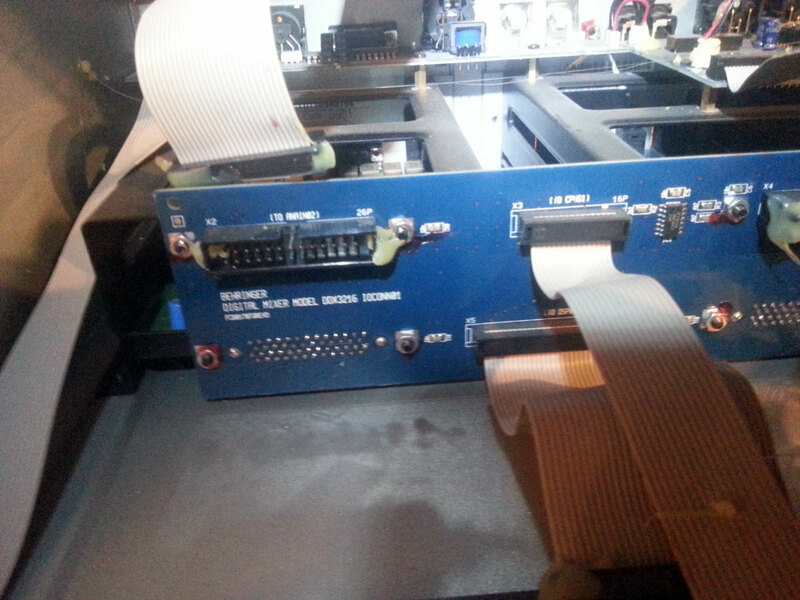 If you actually are going to recap the PSU, marking the cables is not absolutely required at this point, since you will have an opportunity to mark them once the PSU has been opened. 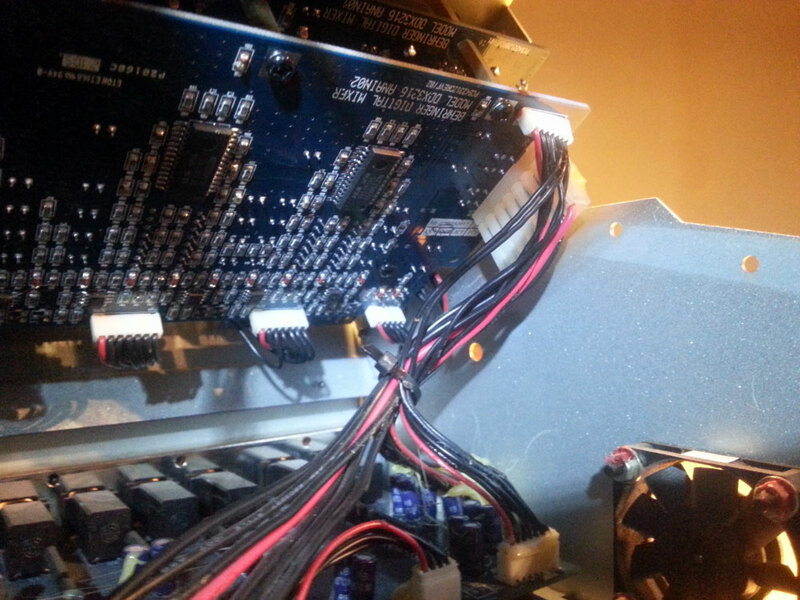 The intended cable destinations are clearly marked on the PSU PCB. One of the CPU card power connectors (going to control PCB). Carefully remove the glue and you can remove it. Upper desk connectors. The large power connector is removable, the little one disconnects from the other end (on the bottom of the picture). Again, if it has hot glue, it probably is removable. Lower part connectors. 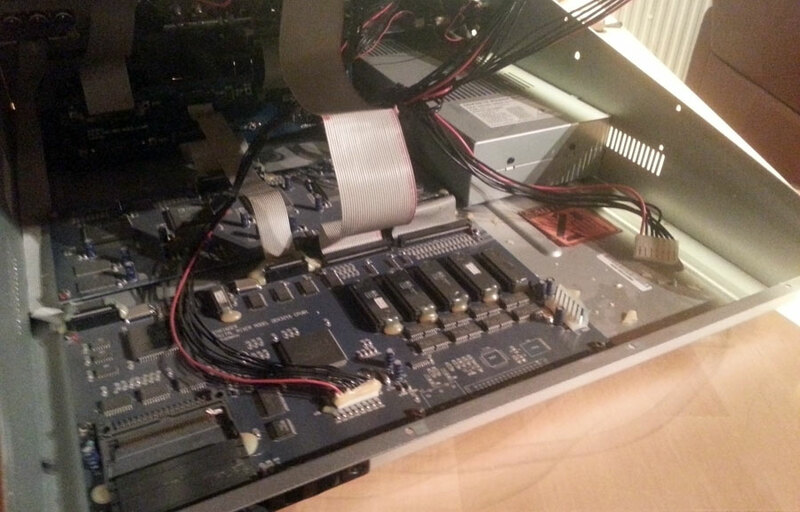 You have to remove the fan cable (the connector is on the upper part, on the control PCB) and the ANAOUT1 board 2-pin connector. Flat cables. 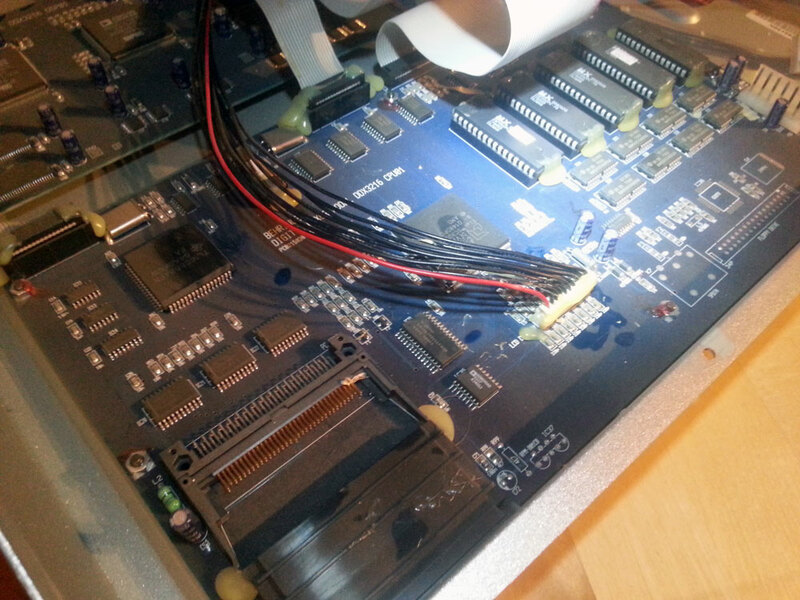 At this point you only need to disconnect two of the connectors (one from IOCONN1, one from the upper control PCB). 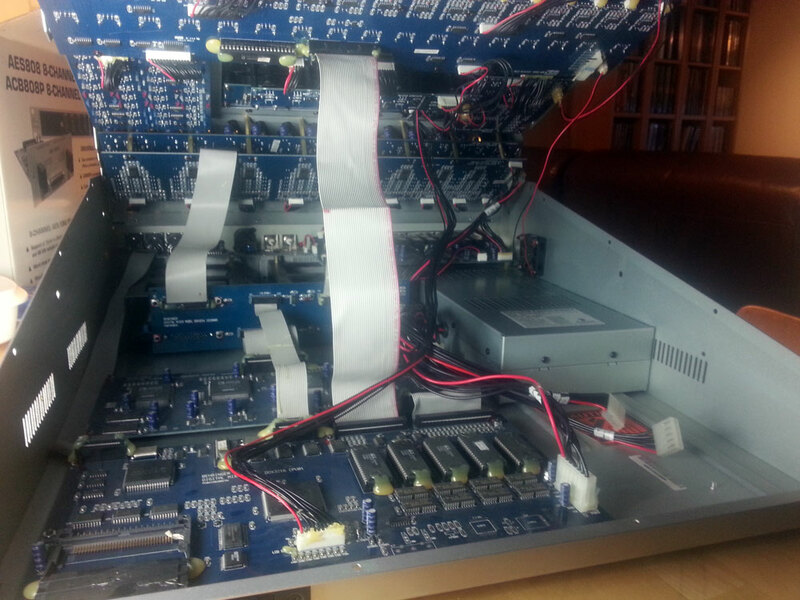 When you later remove ANAOUT1 board, there is one more flat cable to disconnect. Oh look. It's a 386. From AMD. Oh well. By the way, if you're wondering where the fail-prone Q3 crystal is (as I was, since I only saw the standard PCB mount crystals Q1 and Q2 on the board), it is not the usual square metal case type. Q3 is circled in red in the following picture. 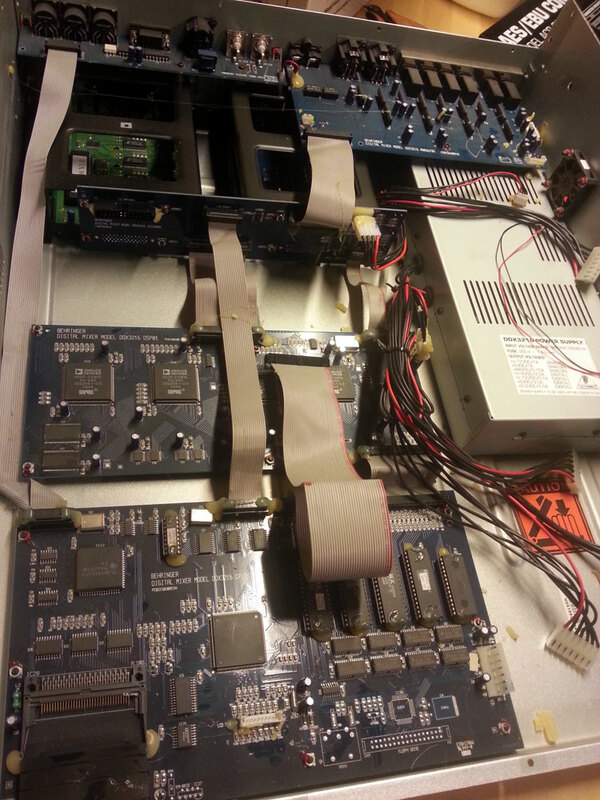 Note that the PCB has room for floppy disk controller and associated electronics (including the header for flat cable). You can also find a place for IrDA. Maybe someone wanted to have remote control for the desk. Power unit is removed by opening the screws on the left side of the mixer, the ones on the bottom and the ones on the back of the mixer. The case fan can stay in place. Also, you need to remove the analog out board, since lies on top of the power unit (and is actually connected to it by screws). Remember to remove the screws from the back plate (the connectors are locked in the plate by screws). The analog board has 5 screws inside the case. When that is done, the power unit should be loose and pulls out from the case. If not, check for screws and more screws. PSU has multitude of screws all around. Remove the ones on the top part, and the case opens. Ah! One capacitor already in the going-to-screw-you-soon -mode. 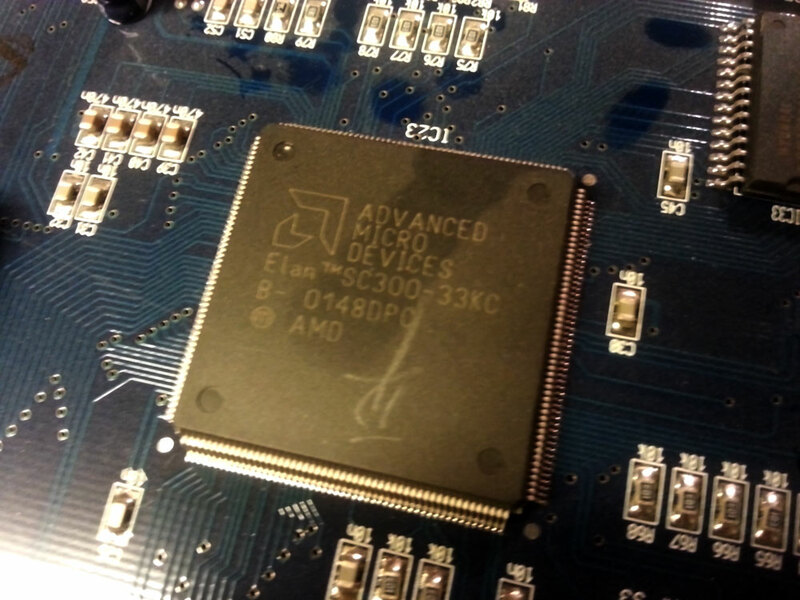 Some of the cap positions on the PCB are a bit confusing - just keep notes when removing them, and it should all be clear at the end of the removal process. 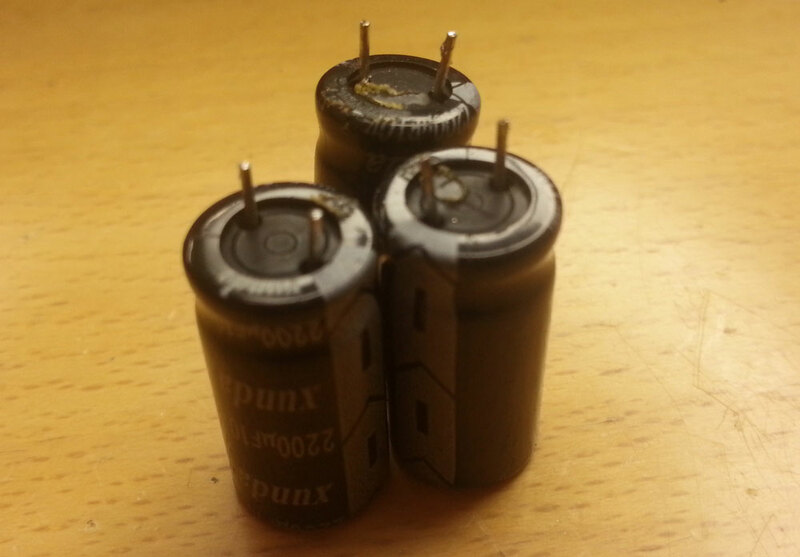 I had only 1 bulging capacitor, but once the caps are removed, the truth is revealed. 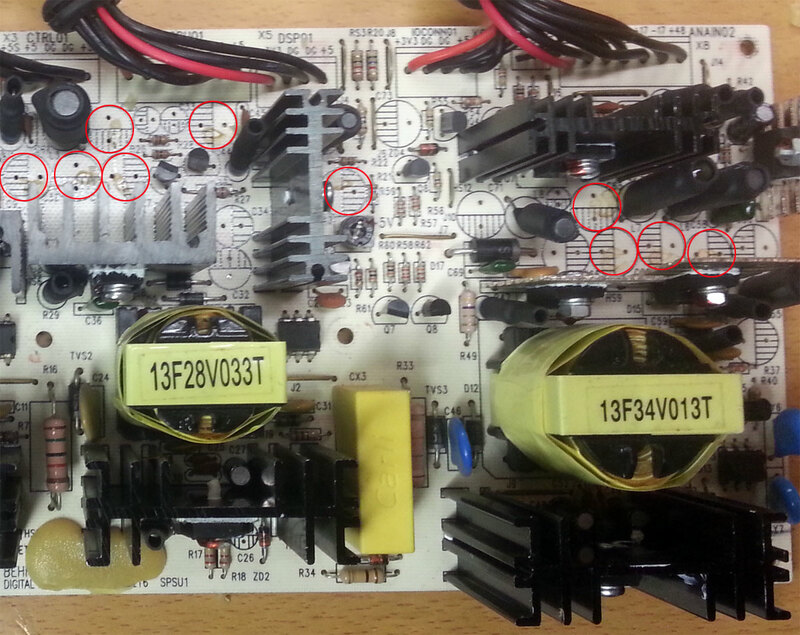 All the 1000uF/25V and the 2200uF/10V caps have been leaking (circled in red). The caps themselves also have the tell-tale signs of things gone bad. New caps are in place. 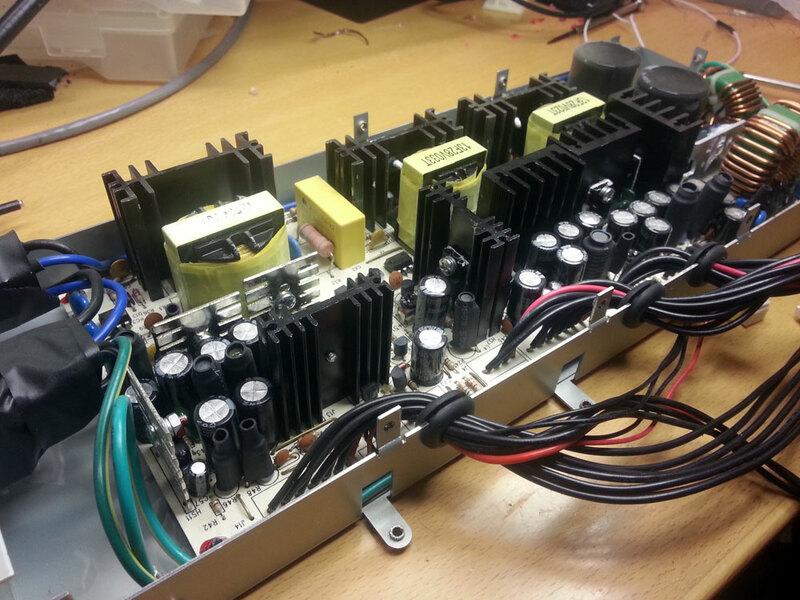 All new capacitors are Panasonic Low ESR models, made especially for switching power supplies. Total cost was around 20 euros. At this point, PSU has not been tested yet. 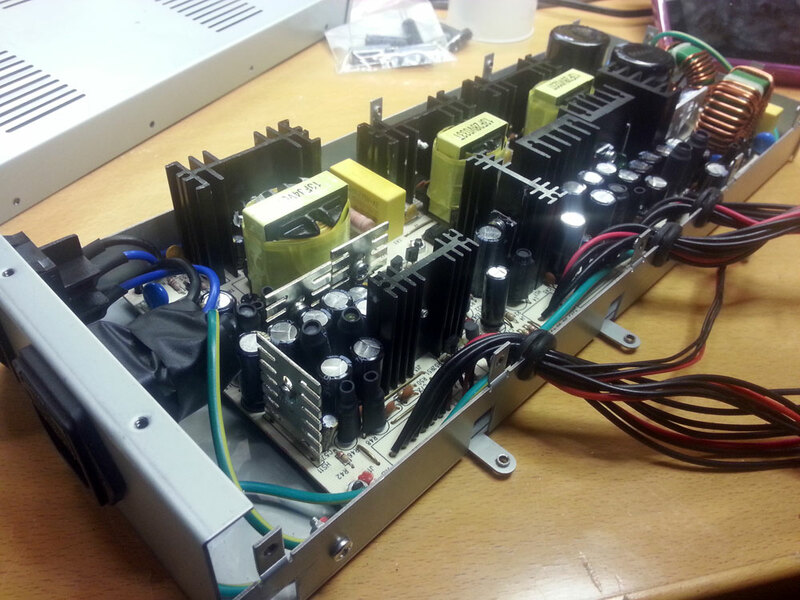 I tested the PSU without the dummy load (schematics for it are inside the PSU schematics PDF), since the PSU was working when I started this project. 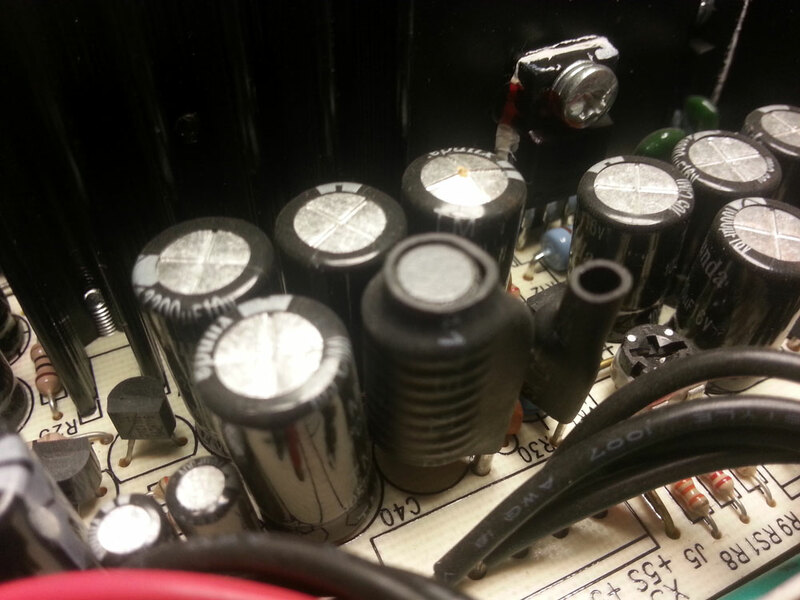 All was good and well, only the analog +5 volts was a tad high (5.19V). I adjusted it down to 5.1V, I expect it to drop a bit while under load. Some of the cap "groups" had a dab of hot glue added on top of them, just to provide some support and share the load on the cap legs, should the mixer meet some unexpected vibrations or such. Not really necessary in a home studio environment. Next picture: Putting it all back together. At this point both the upper and the lower parts of the mixer had already met mr. air compressor, and all the dust you see in the previous pictures is gone. Recommended procedure for any device you happen to dismantle for any reason. Also, the connectors were quickly cleaned with some PRF Blue. Check that the power connectors align properly when you insert them! Some of the connectors are hard to see - make absolutely sure you put them in place so that the pins are where they are supposed to be. Check twice. From all the angles. 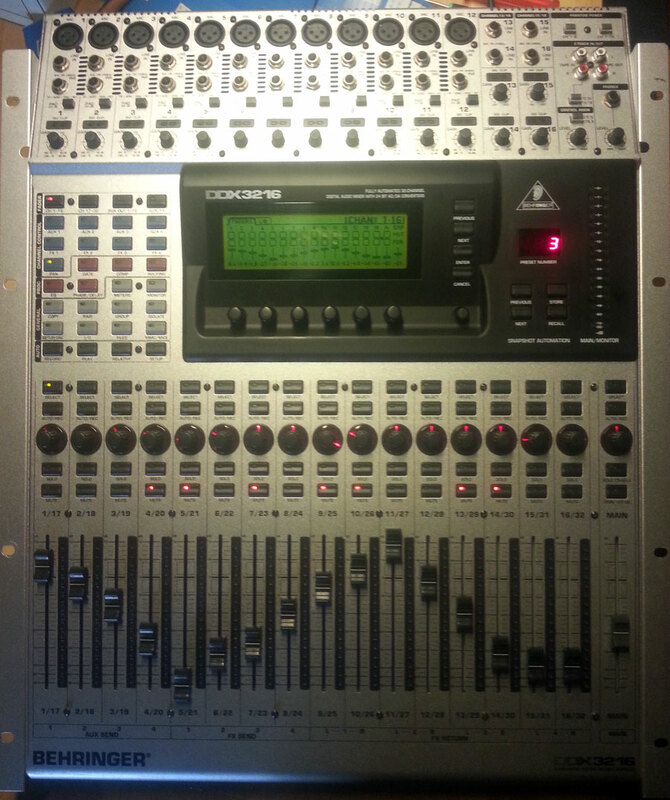 Note: you can lock the mix plate in quite high open position (say, with a drumstick carefully inserted between the motors in the mix plate and the corner of the lower portion of the case), as long as you leave the fader board power connector disconnected. And that's it. Test it before you apply the glue (if you're going to use any), and if all seems well, prepare yourself mentally for the task of putting all the screws back. Not an easy job. I recommend working your way from the back of the mixer to the front, since the upper plate is not that rigid, and to get the middle screws in place, you need to lift the plate from the front a bit. Et voilà! Ready for action.